Synthetic peptide (the amino acid sequence is considered to be commercially sensitive) within Human GDI1 aa 400 to the C-terminus (Cysteine residue). The exact sequence is proprietary. U87-MG, HeLa, SH-SY5Y and Human fetal brain lysates; Permeabilized SH-SY5Y cells. Our Abpromise guarantee covers the use of ab175194 in the following tested applications. 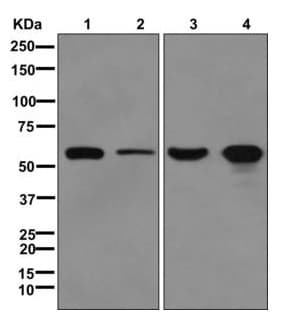 Defects in GDI1 are the cause of mental retardation X-linked type 41 (MRX41) [MIM:300104]. Mental retardation is characterized by significantly sub-average general intellectual functioning associated with impairments in adaptative behavior and manifested during the developmental period. Non-syndromic mental retardation patients do not manifest other clinical signs. Defects in GDI1 are the cause of mental retardation X-linked type 48 (MRX48) [MIM:300104]; also known as MRX3. 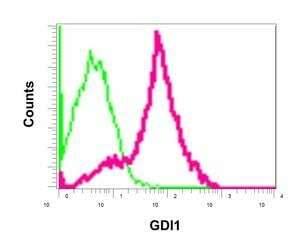 Flow cytometric analysis of permeabilized SH-SY5Y cells labeling GDI1 with ab175194 at 1/10 dilution (red) or a Rabbit IgG (negative) (green). ab175194 has not yet been referenced specifically in any publications. Publishing research using ab175194? Please let us know so that we can cite the reference in this datasheet. There are currently no Customer reviews or Questions for ab175194.